November is Diabetes Awareness Month. Communities and organizations throughout the country observe National Diabetes Awareness Month to bring attention to diabetes and its impact on millions of Americans. November also means it's Thanksgiving time. Living with diabetes can be challenging to manage every day, but there’s no reason for diabetes to wreck Thanksgiving dinner. You can find many recipes and helpful hints for diabetic care online and in the media throughout the month. For many with diabetes, common Thanksgiving recipes pose a problem, but we have some healthier recipes to keep tradition alive. Thanksgiving dinner features classic holiday foods like stuffing, turkey, and pie. Since turkey is low-carb lean protein, it’s often on the “should eat” list. Seniors living with diabetes can enjoy their Thanksgiving dinner traditions using recipes for healthier versions of classic dishes. Even if you can't be with your senior on Thanksgiving, there are ways to celebrate. If a senior is far from family or friends on Thanksgiving, prepare a turkey breast and small side servings instead. This keeps the tradition alive without exacerbating feelings of loneliness or creating excessive leftovers. 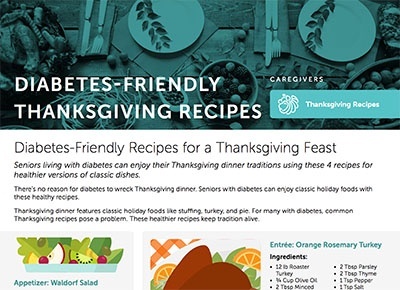 For diabetes-friendly Thanksgiving recipes and tips for using leftovers, sign up for ClearCare's free Marketing Monthly program and download November's articles.